Ankle Fracture Symptoms: What Are They? - Jeffrey H. Berg, M.D. You’ve just twisted your ankle. You’re having a lot of pain and it’s very difficult to walk. How do you know if your ankle is broken or it’s just sprained? 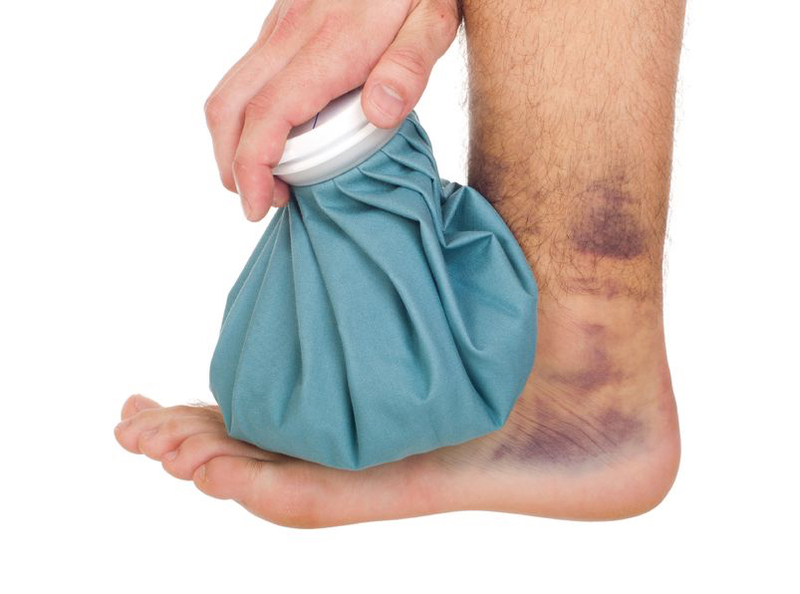 Knowing the common ankle fracture symptoms may help. Typically after an ankle fracture there will be immediate, usually significant pain. The location of the the most significant area of pain often correlates with the location of the fracture. The most common location of an ankle fracture is on the outer side of your ankle (lateral side). That is the side farthest from your other ankle. This also happens to be the general location of the area most commonly painful after many ankle sprains. Although the lateral side is the most common location, fractures and pain often can exist on the inner side of your ankle (medial side) as well. Even more rarely, they can occur in the back and front of your ankle too. Swelling also often develops very quickly after an ankle fracture. The swelling may also be localized to the location of the fracture but often it is more diffuse. Along with the swelling, stiffness also often occurs. The ankle will often feel “tight” and your ability to move your ankle will often be diminished…and accompanied by pain. After some time, it is not uncommon for “black and blue” skin discoloration to occur. This results from bleeding from the fractures and associated injuries into the local soft tissues and skin. It is very difficult to place weight through your injured ankle after an ankle fracture. It is even more difficult and usually impossible to transfer weight back and forth from your good ankle to your injured ankle and to repeat that for several steps. Ankle fractures can, on occasion, be associated with a dislocation of the ankle as well. If so, there is likely to be a very noticeable deformity. Frequently the ankle will be rotated or angulated to the outer side. If so, there may be prominence on the inner side. When this occurs, it is not a subtle deformity but unfortunately a rather obvious one. It also calls for urgent care. So don’t delay, get to a nearby emergency room quickly. Occasionally when there is an ankle fracture, particularly when there is an associated dislocation with deformity as described above, fluid filled blisters can develop around the ankle. These can be small but at times can be quite large. The fluid within them is often darker than that in typical blisters. At times, the blisters may be blood filled. In more severe injuries, the fractures or deformity can disrupt the skin and lead to exposure of the underlying bone and fracture area. This is an emergency as the exposed fracture site can lead to bone infection if not treated promptly. Ankle fractures are common. Their symptoms are too. If you have these symptoms after an ankle injury, it is a good idea to visit your Orthopaedist and get an evaluation.